While Cambodia has achieved remarkable socio-economic progress in recent years, with poverty levels declining, there are still inequalities and many children lag behind. Children from poorer families and in remote communities still face challenges to their healthy growth. Malnutrition rates remain high and access to health services and water and sanitation is not equitable. mother of 9-month-old girl, and inputs the information into a tablet. Longitudinal studies are a type of survey that is primarily observational. One set of people are asked the questions, and then after some time, the same people are asked those questions again. “This allows us to look at change, at individual level and not just change in the population as a whole,” explains Dr. Etienne Poirot, Chief of Child Survival and Development with UNICEF Cambodia. “This is our best tool to understand how people change and how we should prioritize our multi-sectoral interventions that cut across the areas of health, nutrition, water and sanitation, as well as education. The longitudinal study can make a particularly valuable contribution to strengthen national policy in different sectors involved in early child development.” he added. Working with Village Health Support Group volunteers, target groups were selected in the three provinces of Phnom Penh, Kratie and Ratanakiri, focusing on children under 2 years old, their mothers, women of reproductive age and pregnant women. Trained team members conducted a baseline survey when the project was launched in March 2016. They collected detailed data covering the socio-economic situation of families, health-related and child feeding practices, water and sanitation conditions, children’s cognitive development and the level of health knowledge. stations at the longitudinal study field site, to support her team members. Today, three months after the baseline survey, Ms. Dy’s team is conducting a follow-up session at Khor village. The weight, height and mid-upper arm circumference of children, their mothers and pregnant women are measured and recorded. The team also collects samples of water consumed by families, porridge the children eat, and other vital samples for testing at the lab. Ms. Dy constantly moves from one work station to another, lending a hand and answering questions. “I am happy to be part of a project aiming to improve health and nutrition services so children can be healthy. It also makes me happy to see lots of children and mothers coming back, because this means they understand that our work is important and that they care about their children’s health,” Ms. Dy said. While the main purposes of this project are to collect data, learn from the evidence and adjust early childhood programmes, other benefits are already evident. “My job is to find solutions to problems in the field. When we come across children or mothers with severe acute malnutrition, I contact the office so that UNICEF can be notified to refer them to treatment services,” Ms. Dy explained. When a child is identified as severely acutely malnourished, a special report is generated and shared with the project managers in IRD and UNICEF. Conducting long-term research such as this has its challenges. 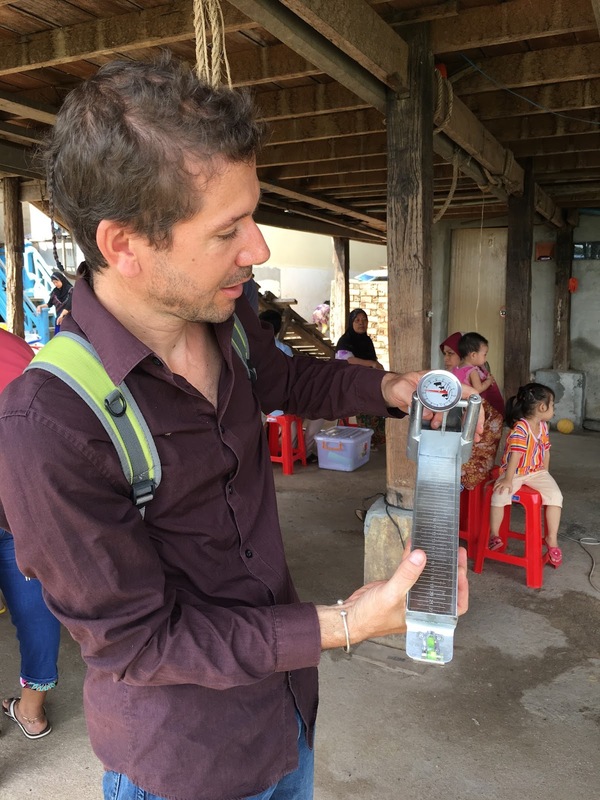 Sebastien Kagan, the project coordinator, said the main challenge in Phnom Penh is finding women and mothers during the day, as they are busy working. He said that about half of the children who came to the survey site in the Phnom Penh villages were brought by a grandparent, a neighbour or a relative. In the other two provinces, Kratie and Ratanakiri, which are predominantly rural, the teams often find it difficult to reach villages due to distance and road conditions, especially during the rainy season. Tablet used in the field to collect data. “We call the village health volunteer to ask about road conditions first. And if we can’t go that day, we have to shift the schedule to visit another place,” Mr. Kagan said. Additionally, more villages have to be covered in Kratie and Ratanakiri provinces due to the smaller population size of communities there. Today, Mary Et, the mother of a 9-month-old girl, Saiyana, has come along with her daughter and her pregnant sister for a follow-up visit. “I decided to be part of this project because it has benefit for both myself and my child. It can improve our nutrition condition,” she said. Her sister, Roya Et, who is six-months pregnant and the mother of a five-year-old, agrees. “The team asks us about what we feed our children, about breastfeeding and other things about our health. This is good for us, because we get to know more,” Roya said. The team stays at the site until all mothers and children have been seen, which means that sometimes they finish late in the afternoon. When all measurements and interviews are completed, the team goes back to the office to debrief with the field coordinator. They share their experiences, discuss problems, and modify their approach for the next field visit. It’s a constant learning process, according to Mr. Kagan. the consistency of porridge given to children. The team leader uploads into the system all data collected in the tablets used in the field by the survey teams. 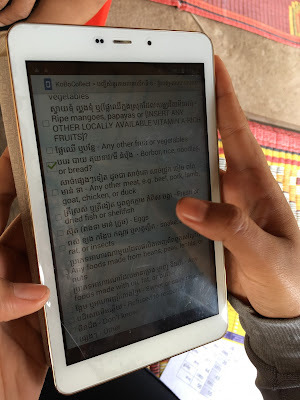 Using tablets allows the researchers to review the data at the end of the day and check its accuracy, which would be impossible using paper-based data entry. “I say to the teams that this is not just collecting data for research or writing a book. It’s data that’s going to change the life of Cambodians because it will be used to improve services. I think because they understand this, they take their work very seriously,” Mr. Kagan said.